I am a fan of Jessica Day George. There is no denying that. 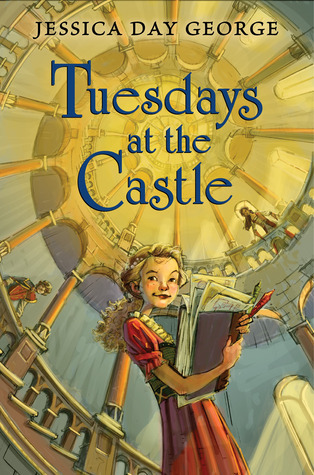 But most of what I've read by her has been more on the YA side than the middle grade side, so even though I was super excited for Tuesdays at the Castle, there was still the question of whether I would like her MG stuff. I'm not sure why I was worried. It flowed along so well and kept me going. Two sittings and I pretty much engulfed it all, continuously telling myself "I should stop after X, I should stop after Y..." and I just couldn't seem to do it. Tuesdays at the Castle is absolutely darling. I don't know how to make that not sound like a creepy old aunt who wants to pinch people's cheeks, but it's true, it was darling. There is an...effervescence to George's characters that I just love, and Celie was no exception. [I guess if I'm being honest, I kinda did want to pinch her cheeks...] George has a talent for writing books that are wholesome without being boring or saccharine, and are just plain fun to boot. Parents will find little that is objectionable in Tuesdays at the Castle - for the most part. I mean, an assassination attempt on a 14 year old might be a little harder to explain to someone on the younger side of the scale, but generally it is very clean and handles delicate situations without being too adult or inappropriate, but ALSO without making light and taking away the tension. And even though it will get the parent approval stamp, it's never in that way that it ends up being off-putting for kids (mom said I can read it and now I don't want to...). It's a great adventure story with kids at the helm, and because of that, it is delightful. I think so many kids are going to read this and root for the children of Castle Glower as they outsmart and one-up the scheming adults in the story. I think this is one that will capture a lot of hearts and imaginations. The added fantastical element of the living Castle Glower and Celie's relationship with it lends a great magic to the story. It feels so companionable, and the Castle really becomes a character of its own, and you care about it just as much as you do its inhabitants. The relationship amongst the siblings was nice, too, with good dynamics and distinct personalities. They each have their thing that sets them apart, and their take on the situation and what to do, and they work together and play off of each other nicely. But it's the the relationship between Celie and the Castle that really stands out and sets the book apart. It's such a fun fantastic take on a story, and to give a place such personality will really appeal to young readers (and old readers. and those in between). It's just this great adventure story, without ever having left home. I think what I like the most though is that even though it's a series, it makes a great stand-alone. It's so rare to get any book that functions as a complete story in and of itself these dayss. This is the beginning to a series (of course), but George understands the need for completion and she doesn't leave the reader hanging as so many do, or toss in some cliff-hanger or hook for the next book. She (and her publishers, thank god) seem to realize that if you just do the book well people will read the rest. No gimmick required. It's so nice to get a self contained story where everything is wrapped up nicely, there is a beginning/middle/end, etc - a clear cut everything, settled and whole, that leaves you feeling as if it's complete. I appreciate that, I really do, even if I do intend to read the next book (and I do). And I agree, I think it'd be nice if authors who wrote series realized that they just have to write a really good first book in order to persuade people to keep reading. You make me want to read this even more! I saw this one advertised and was intrigued right away! Can't wait to read it! Great review, too!